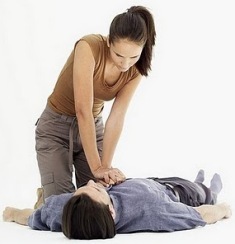 When a person performs cardiopulmonary (heart and lung) resuscitation (CPR), it is sometimes recommended to provide rescue breathing. This is certainly the case when the primary cause of the victim’s difficulty relates to failure to breathe adequately, such as with a drowning episode. When CPR first arrived on the landscape, laypersons were trained to perform mouth-to-mouth breathing (for adults) or mouth-to-mouth and nose breathing (for infants and small children). Following growing concern about transmission of diseases from blood and body fluids, laypersons were introduced to using masks or something similar to allow them to provide breathing assistance (“artificial respiration,” “artificial ventilation,” “rescue breathing,” etc.) to non-breathing persons. Masks have been used for decades by professional rescuers for ventilating patients, often in conjunction with the use of bags in a “bag-valve-mask” configuration. The valve between the mask and bag provides for one-way flow and prevents the backwash of vomitus, blood, liquid from the lungs, or other fluids that might diminish the effectiveness of the technique. This post, CPR: Mouth-to-Mouth Breathing May Have Some Advantages Over Mask-Assisted Breathing, was originally published on Healthine.com by Paul Auerbach, M.D..
Just admit it: Deep in your heart you’ve always wanted to be an emergency medical technician, if at least for a few moments. If you’re located in San Ramon Valley, California, you can now live that dream: The local fire department has released an iPhone app that will alert you of any emergency activity in the area. The well thought-out application will send out a push notification to users who have indicated that they are proficient in CPR whenever there is a cardiac emergency nearby. In addition, the closest public-access automated external defibrillator (AED) is located by the app. Current response status of dispatched units are shown and incident locations are pinpointed on an interactive map. There’s even a log of recent incidents including a photo gallery. For the old-school ham and scanner lads, it’s possible to listen in on live emergency radio traffic. The app is available for free. Nearly 450 people die each day of sudden cardiac arrest. Many times the bystanders who witness a person collapse don’t know what to do. They are afraid they will hurt the victim or they feel nervous about doing traditional cardiopulmonary resuscitation (CPR) with mouth-to-mouth breathing and chest compressions.